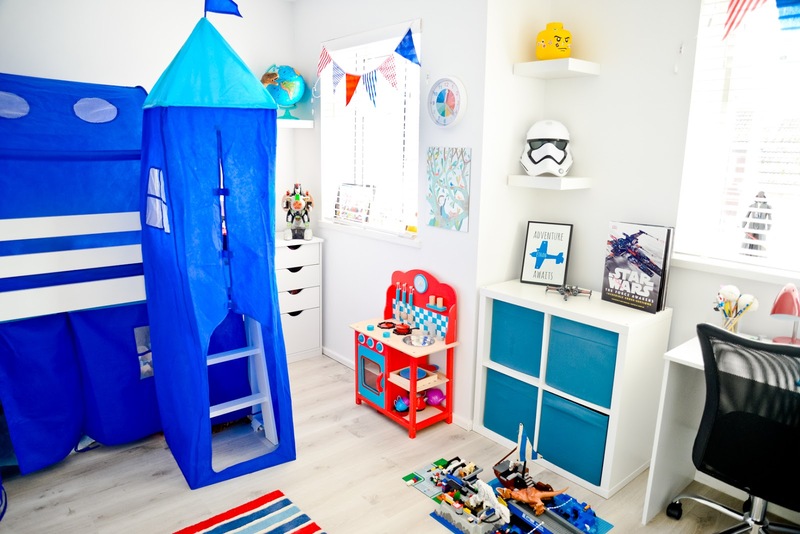 Last year saw us change our house quite a bit - we added on a front two-storey side extension which changed our smallest bedroom upstairs turning it into a really nice sized bedroom for our eldest little boy Ethan. It also changed our kitchen size and the layout. We moved our front door to the front of our house from the side and added on a porch to give us extra storage. 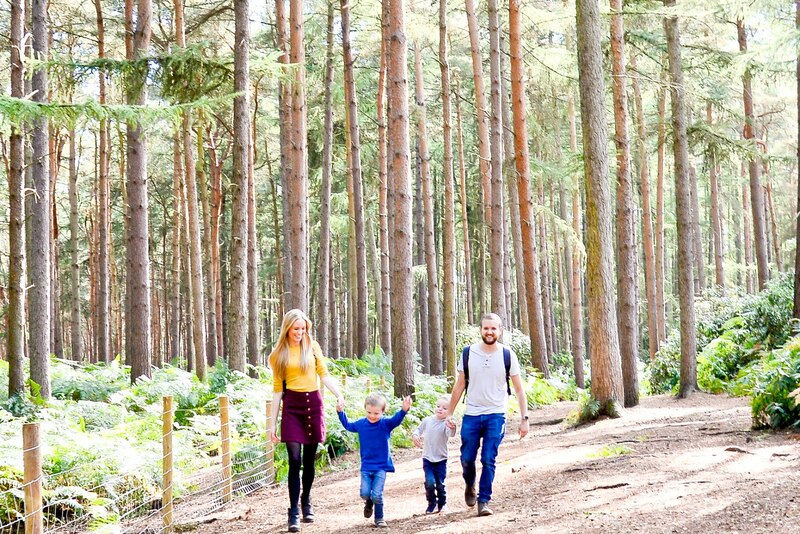 We had our driveway done and also our back garden completely re-done. It was a big project and we're so happy with the results, especially so with our new kitchen space, which has become a really nice family space for us all to live and grow in. 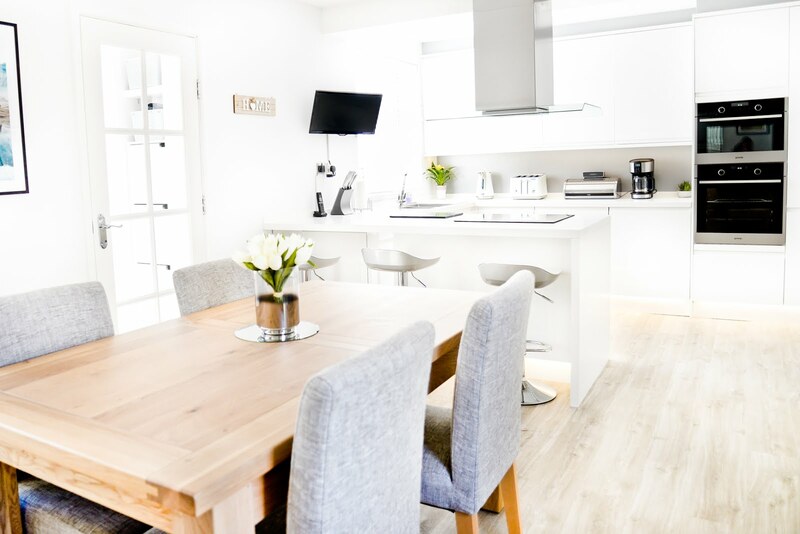 We always knew that we wanted a white kitchen - we were forever pinning our favourites over on our shared home inspiration board on Pinterest. Our new kitchen is from the Clerkenwell Gloss range at Howdens. 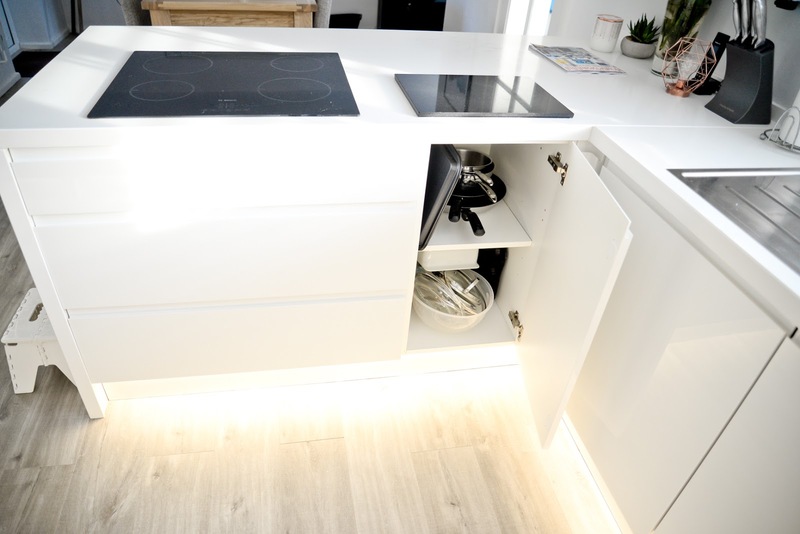 We love the handleless look, the white gloss and also the extra tall cupboards that we went with, which are great for the extra storage as well as giving that 'in-built' look. 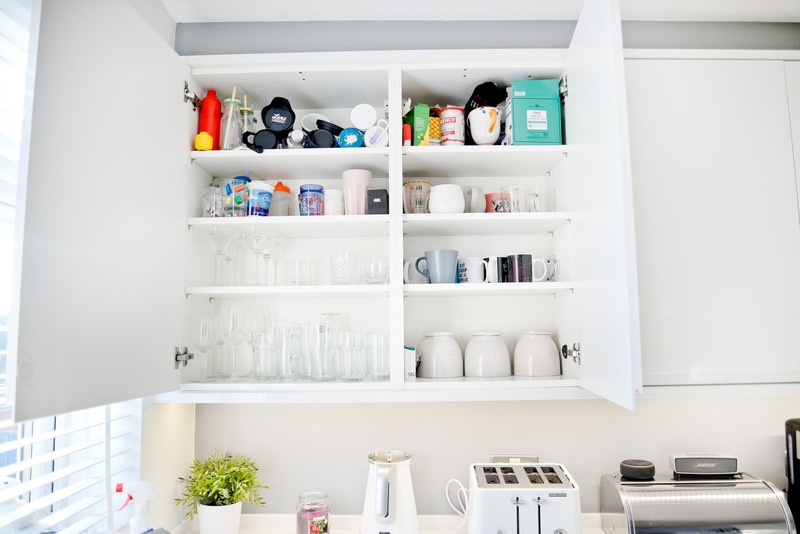 I shared a full room tour of our new kitchen and dining area space previously on my blog which you can see here and so today I thought I'd give you a look inside of our kitchen units and show you our kitchen storage and organisation. As I said above we decided to go for extra tall cupboard units, which means that some of our kitchen units run from the floor pretty much to the ceiling. We had units built around our fridge freezer, so to the side of it we have a floor to ceiling wine rack (which is fully stocked right now from Christmas!). 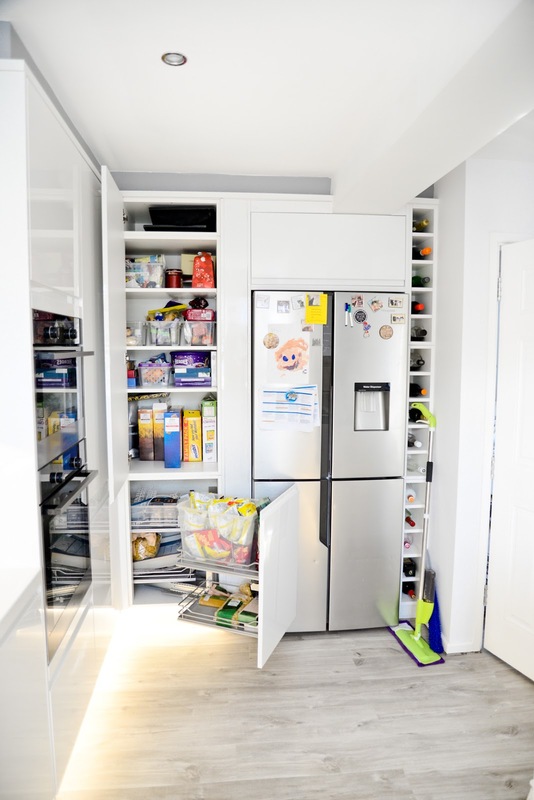 We also have a cupboard above the fridge which is where we keep medicine and things like sun cream and other things that we need to keep out of reach from our young boys. On the other side of the fridge, we keep things like snacks and cereals. Cereals are on the bottom shelf so that they're accessible to the boys for when they start making up their own breakfast and above that we've got individual boxes (mostly from IKEA) to separate things like raisins, fruit bars, chocolates, biscuits and savoury snacks. On the higher shelves, which aren't as easy to reach we keep things like party decorations, spare candles and more seasonal things like our Christmas mugs. We have space to the side of these shelves hidden around the corner and we keep big bulky, less-used items here like spare plates and bowls, our nutribullet and other things that we don't need to access daily. We also have a pull out handy storage unit below that which is great as it gives us better access to the bottom corner. We keep our crisps in a larger IKEA storage tub on one of the shelves in there, along with pasta, a tub of 'random' kitchen bits and bobs and also some spare table mats and a tray. 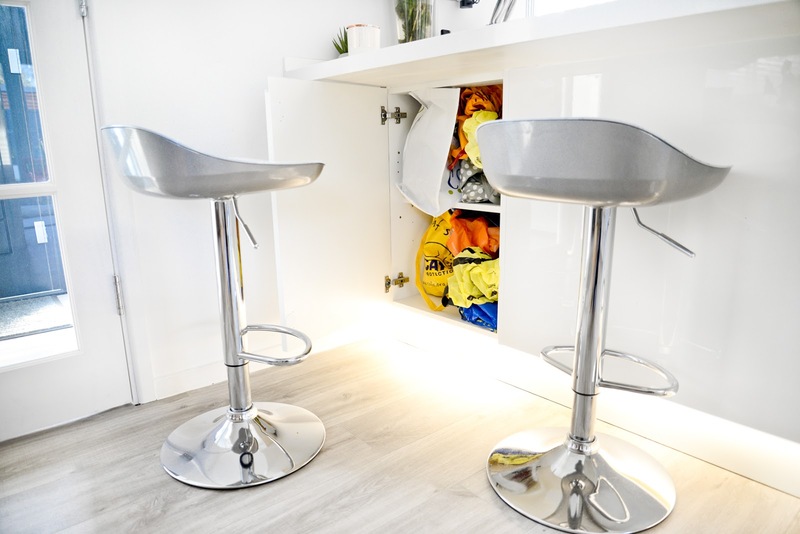 Under our breakfast bar, we actually have a hidden cupboard which is where we store all of our spare carrier bags and bags for life's. It's really handy as they're totally out of the way there - unless you knew about it you wouldn't really even know that they are there. 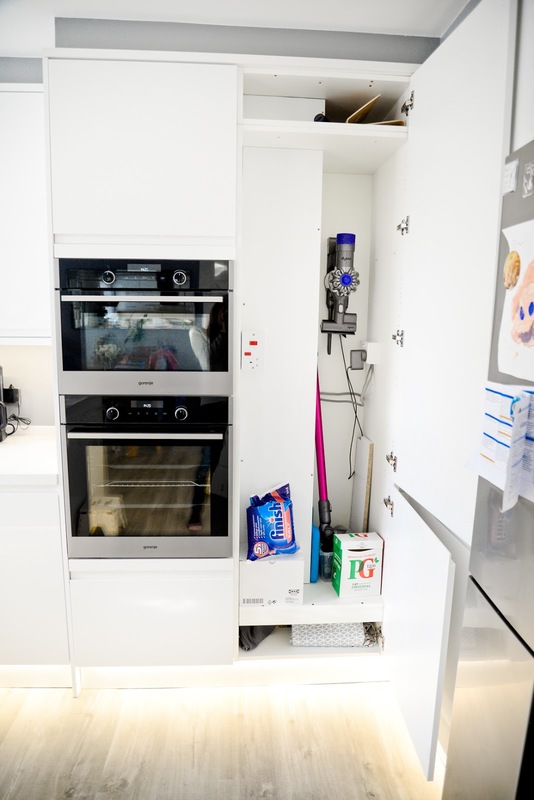 Next to where our in-built oven and microwave are we have another cupboard unit which is there mostly to hide alarge water pipe. Next to the hidden pipe is where we keep our hoover, we've got it so that it can go on charge in there, which is really handy and convenient. We keep some bulky items in there like spare bits for the hoover, space teabags and extra wine glasses. We also keep tea towels in there and a table cover too. Underneath our oven and microwave, we have a drawer specifically for cat food and all of their accessories. And above the microwave we keep all of Adam's tools and also some spare parts for the oven. One of my favourite things about our new kitchen is the fact that we now have our bins built in too, so we no longer have to try and find a spot for a not very nice to look at bin. We have three separate compartments - two for recycling and one for general waste. 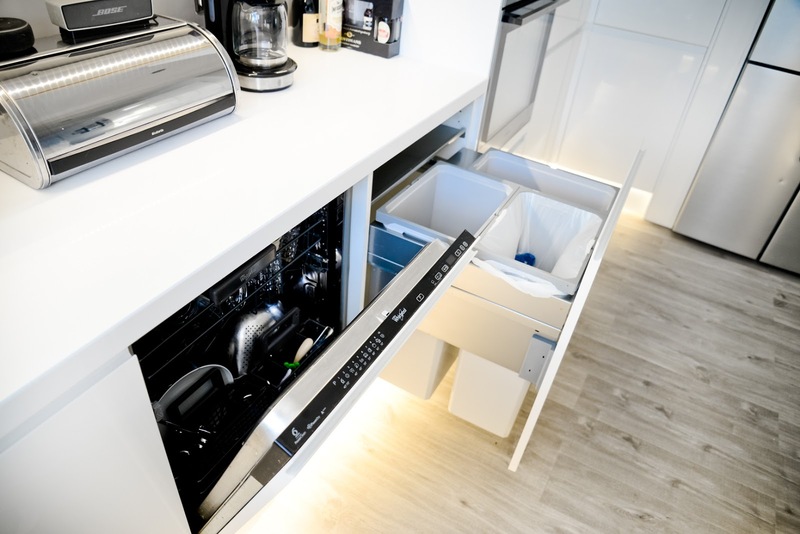 Next to that we have our inbuilt dishwasher. I love that when their doors aren't open, you'd never know that they were there. Next to the dishwasher we have another one of the handy storage pull out systems as without this we'd have wasted hard-to-access space in the corner next to our sink. We use this cupboard for things like food bags, cling film, bin bags etc which all sit in a basket on the top shelf. Under that is where we keep the boys' lunchboxes when they're not in use. And then on the other two shelves we keep all our plastic pots and tubs. 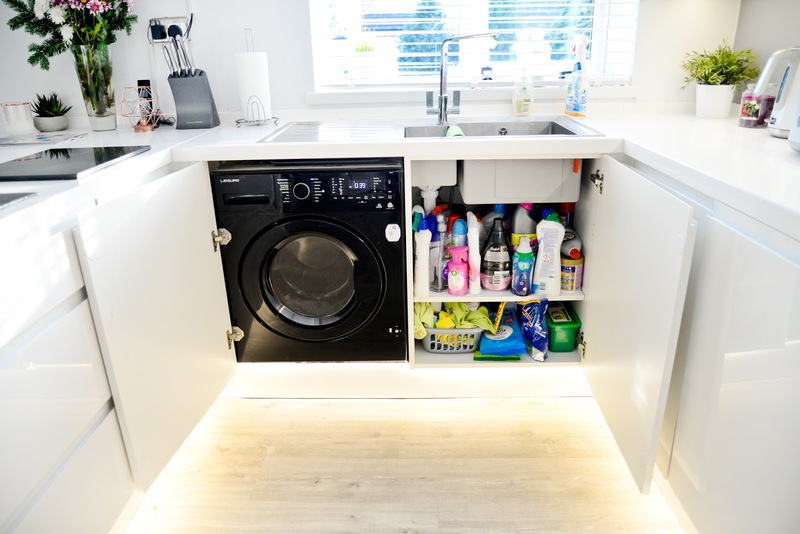 Our under sink cupboard is full of cleaning products like you'd expect and then the unit next to that hides our in-built washing machine. 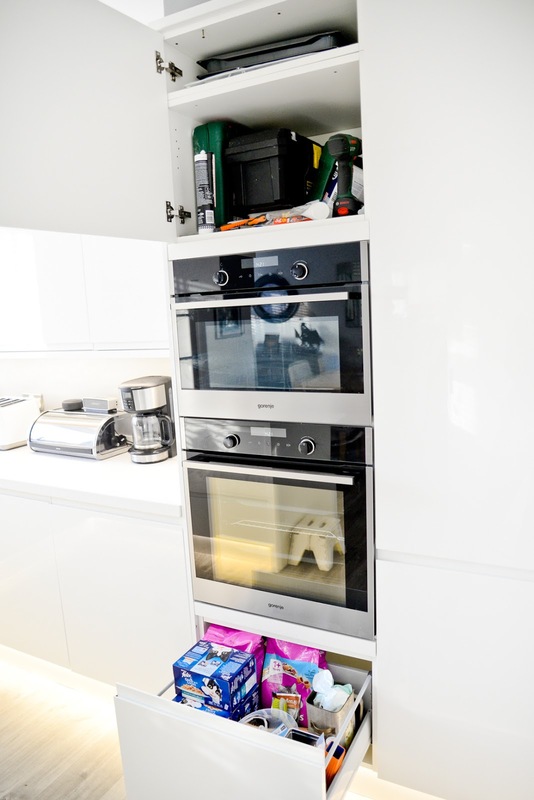 The extra tall cupboard units mean we get an extra shelf, which is great for storage of the food, mugs and glasses. We use the top shelf for things we don't use very often and we have a step stool which we bought from Amazon in the kitchen for when we need to access those shelves. (The stool is also great for the boys in the kitchen, especially for when they're helping with something or if they need to wash their hands). We try to keep our cupboards somewhat organised with tubs (again from IKEA), just so that there is some sort of order to them. 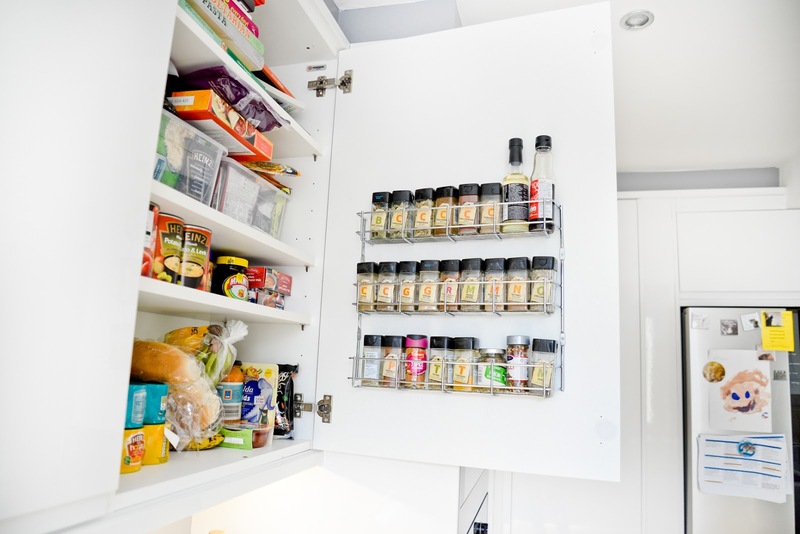 One of my favourite purchases and storage solutions was our spice rack which hangs on the back of the cupboard door. We got it from Amazon (find it here) and it's amazing for giving us extra space in the main cupboard. I love that it keeps all the spices together and in order and that we can always see what we've got and what we haven't really easily. 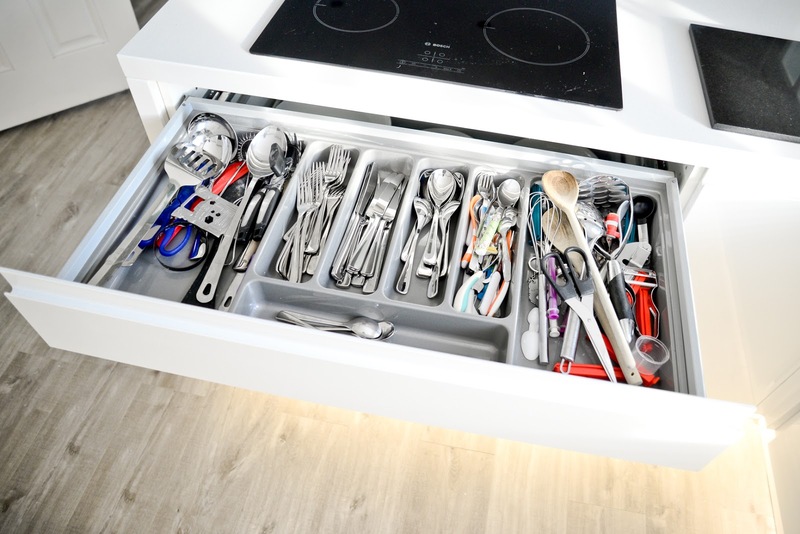 I also love our large cutlery drawer as it has enough space for us to keep all of our utensils in it, which means that we no longer need to have them out on the side in a pot. 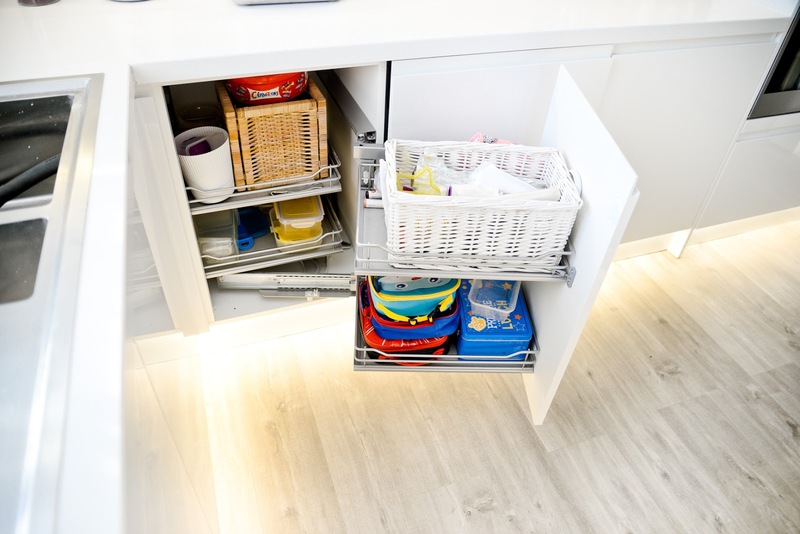 We keep all of our bowls and plates directly underneath the cutlery drawer all in one drawer and then below that we have the kids plates and bowls with some bulky items such as the grater etc. To the side of that, we have our pots and pans (my least favourite cupboard as it's hard to keep neat!) but it's convenient as it's right next to the hob. 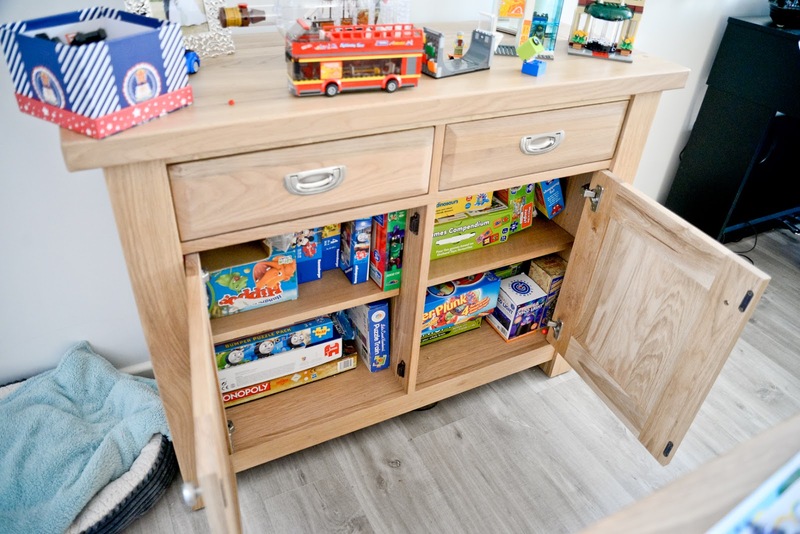 On the dining side of our kitchen we bought a unit to hold all of our family games and some of the boys' puzzles. These are mostly played at the dining table so we thought it made sense to keep them downstairs where we can easily access them. In the drawers above we have another drawer of random kitchen bits and the other is used for table mats and coasters so we can easily access them for dinner time. 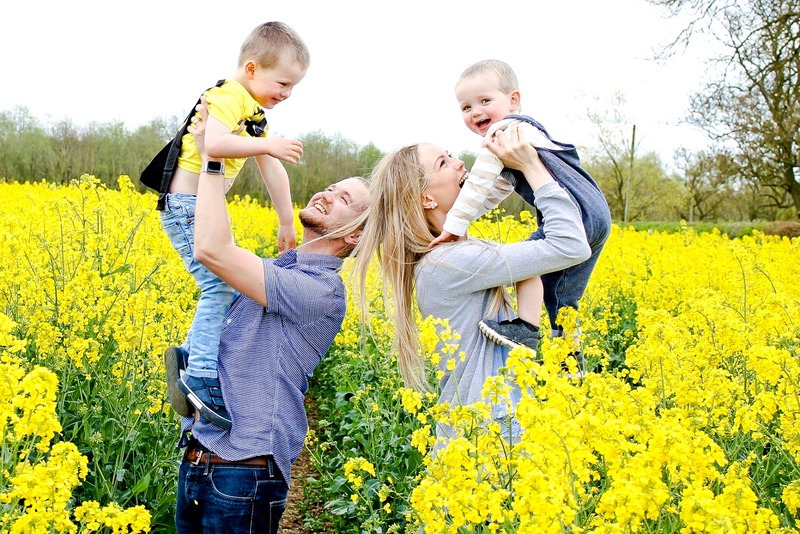 I hope you've enjoyed looking around our kitchen and seeing how we organise everything! 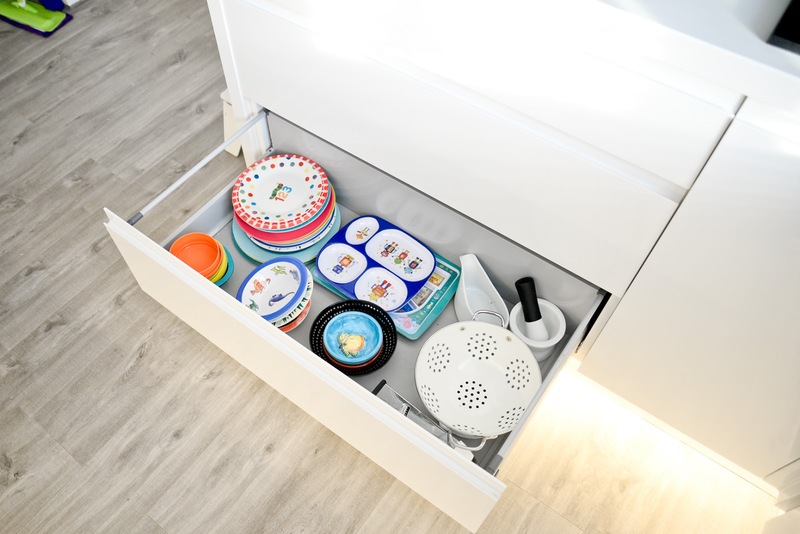 What storage solutions do you have in your kitchen that you love? Look at all that storage and there's serious Spice Rack Goals right there. It's absolutely beautiful and I'd kill to have a kitchen like yours. Oh I LOVE your new kitchen! We are having a load of building work done this year, which I just want done right now! I am not looking forward to all the dust and mess!! I love the brightness of the kitchen and you’ve really used the space well. A breakfast bar has always been a dream of mine to have! 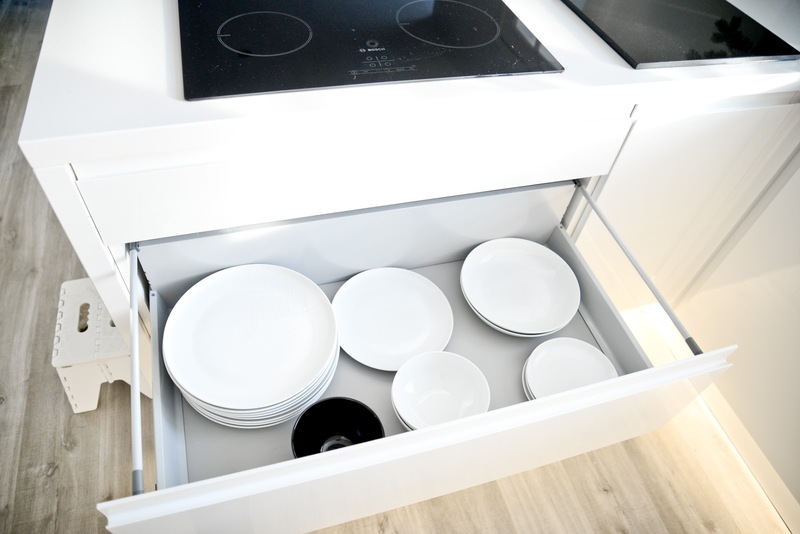 We love all the storage options and it looks very slick! What a fabulous kitchen! So much storage space, and the white really works. So bright and uplifting! Wow, I'm so jealous of all that storage space. Our kitchen is on the smaller side, just a few cupboards and nowhere really to add anything extra. We keep a pantry in our garage for storage. 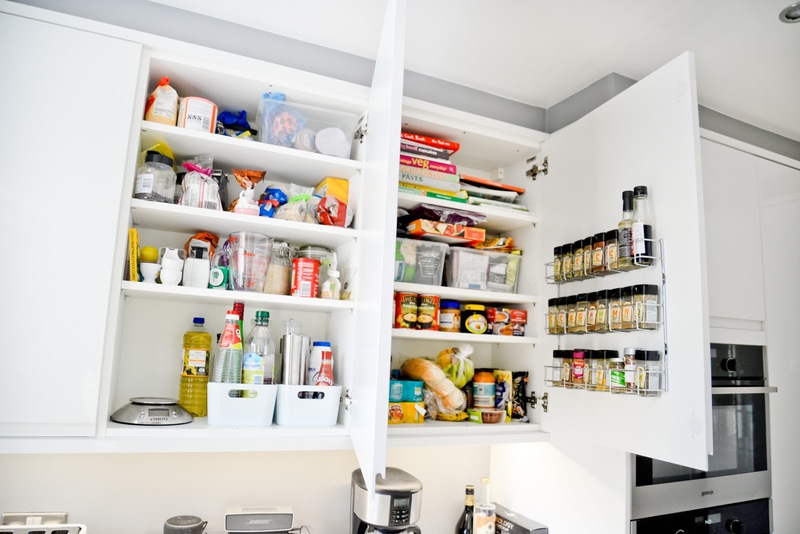 I lover how organised your cupboards are. Mine definitely need some help.